The recipient of the letter is Barnabas McDoon, a prosperous merchant who lives in London in the year 1812. It is the postscript of the letter, however, that truly sets Barnabas to wondering about the possible sender: "We cannot promise heart's desire. But we know what you seek and can help you regain what you have lost. Will you take the chance?" 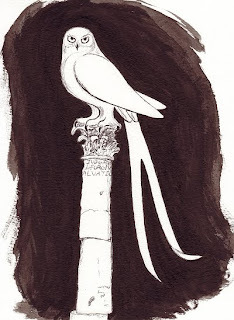 "...In another place there is a sort of antelope we would call in English something like 'Chiming Sebastians.' As they skip along they utter ringing notes that sound like they are chiming out, 'pass the mustard, pass the mustard.' Imagine herds of them loping over the savannah, how the air shimmers with their music!" Reglum raced ahead like the antelopes he described, saying, "Natural phenomena too are not always hideous in the Interrugal Lands. Once, while serving on the Curlew, I saw a rainbow created by starlight only, the oddest colours refracted over the sea. We do not yet fully understand the optics but no Marine who saw that sight shall ever forget its beauty..."
I adored the characters, who are complex and fascinating, as well as the way in which so much about them is revealed through skillful use of dialogue. The story abounds with strong female characters in particular. There is the intelligent and resourceful Sally, who is not just a whiz at learning from textbooks but has a keen mind for applying her learning in unconventional ways. And then there is Maggie, a black servant girl and math savant living on the edge of starvation in London, who finds an unexpected ally in another strong woman. I loved that there is ambiguity in the characters - there are "good guys" and "bad guys," most definitely - but those are definitions not to be taken at face value, and as the story progresses they require periodic re-examining. Characters make mistakes and suffer the consequences, which can be harsh indeed. Another aspect of the book I found highly enjoyable were the many references to beloved characters from literature who are portrayed as contemporaries of the characters in this novel. Sally corresponds regularly with Elizabeth Bennet, for example. Jack Aubrey and Horatio Hornblower are also mentioned, along with news of the war against Napoleon. I had to smile at the reference to the never-ending legal case of Jarndyce and Jarndyce, from my favorite Dickens novel. It is not necessary for the reader to know who Ralph Nickleby and Daniel Quilp are in order to appreciate the story, but it certainly adds to the fun. The illustrations are lovely and evocative. They are a perfect complement to the atmosphere of the story - and I love the fact that the artist who created both the woodcarvings on the cover as well as the interior illustrations is the author's wife! The image on the cover is from a series of carved sea monsters called "Here There Be." Click here to view the entire amazing series. This book is targeted at young adults, and while I think that it has considerable appeal to that audience (strong readers in particular - those who enjoy books by Tolkien, Dickens, Croggon and other complex literary works), I fear that the YA "label" might prevent it from finding its way into the hands of adult readers as well. There are important young characters in the novel that teen readers would be sure to identify with - but there are also adult characters who are every bit as appealing. It seems to me to be one of those rare and wonderful books that offers a reading experience that may differ from younger reader to older reader, but is no less rich and rewarding to each. This first volume in the series concludes at a natural point in the narrative, although some intriguing questions are raised that beg to be answers. I anxiously await the next book in this powerful, compelling series. Click here to read the prologue and first three chapters of the book. Fantasy Book Critic: "...once I got into the novel and immersed myself in its wonderful atmosphere and its usage of charming archaic language and obscure or made up words that fit perfectly, I could not put it down until I finished it." Grasping for the Wind: "The Choir Boats is Gulliver's Travels crossed with The Golden Compass and a dollop of Pride and Prejudice. 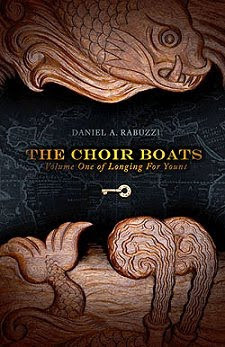 Rabuzzi has a true sense of wonder, which is clear in his narrative construction and a through knowledge of the time period in which his story is set." Unbound: "In many ways this is a gentle read, perfect for curling up on the sofa with a hot chocolate and allowing yourself to be drawn away." This looks ever so slightly reminiscent of Here, There Be Dragons by James Owen. I really like the cover. Great review, thanks! Heck, I have to get hold of this if only for the cover. That is gorgeous! I love woodcuts and things like this - so beautiful. Wish I could learn how to do them. This one sounds fabulous, and goes on the list immediately. I'm particularly excited about the strong female characters -- always a big deal for me. And I hadn't heard of this book yet, so I'm excited to find it! Mariel - I think you would love this book. It has that same rich mythological feeling of Croggon's books, which I know you love (in fact, I think I'll edit the post to include her name as well) - it's dense and lyrical in that same way. I'd love to hear what you think if you read it! Jenny - I love the cover, too - and did you see those other monsters in the series? Really amazing stuff. Kiirstin - It is an amazing book, and I think you'll enjoy it. And the female characters are not only strong, but complex and interesting, very different from each other. I'll be looking forward to hearing your thoughts! Ah now you have said the magic words...and its going straight on my list! Thanks! I'd probably really like this one. Love the excerpts and the owl illustration! Hi, Darla. Thanks so much for your review. So glad you enjoyed the book! The second in the series will be called A Tax from Heaven. If all goes well, we're hoping to release it in late 2010. Your review has just inspired me to add the novel to my upcoming amazon order. Thanks for the new discovery! Ladytink - I think you would enjoy it. The illustrations - particularly that owl, really fit the story perfectly. Charlotte - oh, I don't think that familiarity with Dickens will make that much of a difference - it just added to the fun for this English major. I am sure that there will be many more good reviews of this one - and I hope you'll give it a try! Through the Reading Glass - Oh, I hope you'll enjoy it as much as I did! That Lady Audrey series looks so interesting, something I would like! Very nice review, Darla. I definitely want to read this one. Love the wood cuts and the story sounds good. VA Gal - If you're in the mood for a dense classic with a leisurely pace, give Lady Audley's Secret a try. If you enjoy Wilkie Collins, I think you'd enjoy Lady Audley! Hi, Heidenkind - I agree! And they really convey the atmosphere of the book. I hope you enjoy it if you give it a try! I love the cover and illustration you posted. This sounds like my kind of read, thanks for the review as I hadn't heard of it before. Rhinoa - I'd say this one is definitely up your alley. It has only recently been published, so hopefully you'll be seeing it soon!